Quick Step's Alessandro Proni took his first pro win on a big stage Monday, winning Stage 3 at the Tour of Switzerland. Proni broke away along with Luis Pasamontes of Unibet.com and Daniel Navarro of Astana early in the Tour de Suisse's longest stage, and the trio stretched their advantage to 11 minutes. Near the base of the last climb, Proni shed his breakmates, with the peloton closing fast. Over the top, with about 10 kilometers to race, Proni led the field by 10 seconds, and held off the slashing field to take the day by 7 seconds, with Bouygues Telecom's Xavier Florencio 2nd and T-Mobile's Kim Kirchen 3rd. Proni, racing in just his 2nd year as a pro, moves up to 2nd overall, 2 seconds back, with Kirchen 3rd at 14 seconds. Pre-race favorites are lurking 20 seconds and more back, including Vladimir Karpets, 9th at :21; Michael Rogers, 12th at :23; Chris Horner, 14th at :25; Damiano Cunego, 27th at :34; and Carlos Sastre, 33rd at :36. It was a Tour de France style climb up Sierra Road today, and the cream of the field was first to the top. A large break went away early, featuring CSC's Jens Voigt, Discovery Channel's Jason McCartney, three riders each from Liquigas and HealthNet-Maxxis, Steven Cozza and Will Frischkorn from Team Slipstream, Jelly Belly's Nick Reistad, QuickStep's Jurgen Van De Walle, and seven others. They got 5 minutes advantage on the field, and Discovery burned a lot of matches chasing. 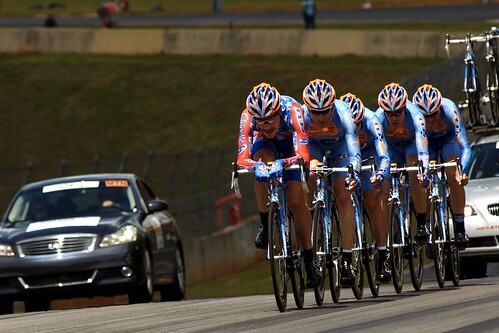 Finally, Rabobank joined in, and the gap started to come down. Then came Sierra Road. The breakaway fell apart on the 10-kilometer climb, and Ivan Basso was the only Discovery Channel rider who could help team leader Levi Leipheimer, with Hincapie and Danielson falling off from the chase effort. Even Basso fell away shortly up the climb, leaving Leipheimer, Chris Horner, and Rabobank's Robert Gesink the strongest of the main field. Voigt and McCartney were best of the break, but Leipheimer's group was sweeping through the break's remnants, closing fast. The five joined up a few kilometers from the summit. Over the top, with 22 kilometers down into San Jose, Leipheimer led Voigt, Horner, Gesink, and McCartney. Fifteen riders were about a minute back, but Leipheimer and McCartney went all out to put some time into the field, and Voigt knew just how to play it. Voigt saved himself for the last kilometers, and when the time came, he delivered. 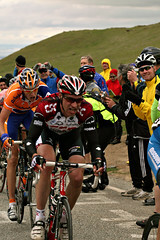 With Quick Step and Paolo Bettini reeling in the leaders, Voigt led Leipheimer, then Chris Horner over the line. Voigt's bonus time moves him into 2nd overall, 3 seconds behind Leipheimer. Health Net's Rory Sutherland sits 3rd, at 15 seconds with Chris Horner 4th at 16 seconds back. 3) Christopher Horner, US, Predictor-Lotto, s.t. 5) Paolo Bettini, Italy, Quick Step, s.t. 6) Stuart O'Grady, Australia, CSC, s.t. 8) Dimitri Fofonov, Kazakhstan, Credit Agricole, s.t. 9) Bram De Groot, Netherlands, Rabobank, s.t. 10) Sergey Lagutin, Uzbekistan, Navigators Insurance, s.t. 8) Michael Rogers, Australia, T-Mobile, s.t. 10) Stuart O'Grady, Australia, CSC, s.t. Six ProTour riders and 3 domestic pros will make up the US squad for the world championships in Salzburg, Austria from September 19-24th. All UCI ProTour riders were automatic selections to the team by virtue of their spots on UCI ProTour teams. 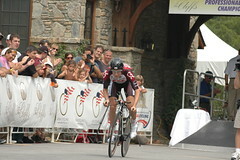 Stewart was an automatic selection as the highest-ranked American in the UCI America Tour standings. Baldwin was the sole discretionary selection for both the road race and time trial. As usual, one of the team's riders hasn't been to the US since childhood: QuickStep's AmerItalian, Guido Trenti. Riders are beginning to confirm their participation (or non-participation) in next week's USPRO championships, in Greenville, SC. George Hincapie, who looks likely to be coming off a win at the Tour of Benelux, depending on today's stage, is confirmed for Discovery Channel, and he'll be riding with Viatcheslav Ekimov as his sporting director. Also racing for the Discos will be Jason McCartney. Tom Danielson will be chasing a Vuelta title in Spain. David Zabriskie and Christian Vande Velde will fly the flag for CSC, but Bobby Julich, who dropped out of the Tour of Benelux this week complaining of fatigue, will not race. Zabriskie has to be a favorite in the Friday time trial championship. Levi Leipheimer will also race, as he winds down his tenure with Gerolsteiner before joining Discovery Channel next season. Freddie Rodriguez and Chris Horner will both be in Europe. Other US pros to watch include defending road champion Chris Wherry of Toyota-United, and double TT champion Chris Baldwin (also of Toyota-United). It's a home game for Hincapie and for TIAA-CREF's Craig Lewis, the reigning under-23 road race and criterium champion. Both live and train in Greenville. I'll be there for one or both days, and hope to get lots of pictures. T-Mobile's Sergei Honchar totally obliterated the field in the Tour's first long time trial, leading all riders by more than a minute at the finish in Rennes. 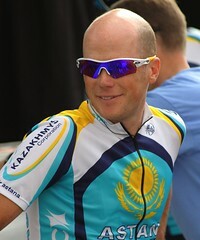 Honchar led at all the intermediate time checks, and becomes the first Ukrainian to wear the Tour leader's yellow jersey. The expected American juggernaut was represented by only a single heavy cruiser, Floyd Landis, who took second on the day, 1:01 behind Honchar. 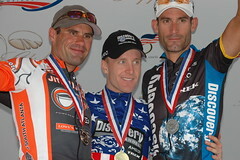 The other US podium contenders finished well down the stage standings, with George Hincapie 24th, Levi Leipheimer 96th (!) at 6:06, and Bobby Julich out of the Tour after a hard crash early in his race that sent him off in an ambulance. OLN said Floyd Landis was forced to lower his handlebar position at the last minute by the UCI, which may have led to a bike change when the clamp slipped. Levi Leipheimer's troubles are still not explained. T-Mobile, dominating the overall standings, moves into the clear lead in the team competition, 3:09 ahead of Phonak, with former leader Discovery Channel falling to 5th, 4:29 back. Gerolsteiner's Fothen moves back into the lead in the young rider's white jersey competition, ahead of Thomas Lövkvist of Française des Jeux. Team CSC has suffered another blow, as Australian sprint specialist Stuart O'Grady may exit the Tour tomorrow. O'Grady finished the day's stage more than 11 minutes down, then was taken to a hospital where doctors diagnosed a fractured vertebra. CSC, already down a rider with the withdrawal of team leader Ivan Basso, will wait until Wednesday morning to decide whether O'Grady can ride Stage 4. CyclingNews.com reports that American Chris Horner believed he had broken his hand during today's stage, but X-rays were negative, and Horner should start tomorrow. Floyd Landis is in monster shape early this year. He won the inaugural Amgen Tour of California convincingly, and today, he put major time into every overall rival for the overall win at Paris-Nice. On the day's last climb, Johan Vansummeren and Alberto Martinez were the first to strike. David Moncoutie struggled to bridge, followed by Samuel Sanchez, Frank Schleck, Toni Colom, Landis, and eventual stage-winner Paxti Vila of Lampre. Nearing the summit, Landis turned up the heat, and slowly dropped his break-mates. On the 18-kilometer descent to St. Etienne, Landis rode like he stole something, with Vila mostly wheelsucking, stretching the pair's lead out to over a minute. At the line, Vila came around for his first pro victory, but Landis was the day's big winner. Some interesting names are lurking 90 or so seconds back, including Haimar Zubeldia, Jose Azevedo and Chris Horner, no mean climbers themselves, as well as Axel Merckx and Erik Dekker. On the day, Landis lost teammates Robbie Hunter, who left the race with a sinus infection, and Aurelien Clerc, who was outside the time limit. He's got to try to hold on to the jersey with just 5 teammates. Bobby Julich lost 8:47 on the day, finishing with Andrey Kaschechkin of Liberty Seguros. An uneventful day in the overall race was a major day in the green jersey chase. Robbie McEwen proved what nobody could doubt -- that he's got the fastest finishing kick left in the field, and that O'Grady's and Hushovd's best chances may be to grab intermediate sprint points through the Pyrenees, where McEwen is likely to seek the safety of the autobus, working with other riders not interested in their overall placing to survive elimination each day. "You saw who did the work today," stage winner McEwen said, blowing champagne kudos to his team. "Today wasn't about me. It wasn't about my third win [McEwen also notched sprint wins in stages five and seven]. Today was about Davitamon-Lotto." "What my teammates did today was absolutely incredible. To bring back nine minutes on day 13 of the Tour, when everybody is tired... It was an absolutely incredible effort." What about Horner, and the ill-fated breakaway? As the duo built up a maximum lead of 22 seconds, it appeared they might just stay away, but instead Horner made up one-half of one of those "tragic breakaways" the Tour produces every year, caught by the field in the dying seconds. "I've seen it happen to many other riders and I knew it was going to happen to me sooner or later," Horner said, still smiling about the day's dramatic outcome. "Too bad it had to come at the Tour. Still, it was a spectacular day. I thought we were going to get caught 30km from the finish, so to make it that close to the finish, it's a little disappointing, but I'll take it. It was a fantastic chance to be a part of the Tour." Horner was later fined 200 Swiss francs for "incorrect behavior towards a rider" for reportedly throwing a water bottle at Da Cruz. Said Horner, "We're doing 50 kph and he's pulling through at 43 and he's just killing our speed. He was saying, ‘No, no, we don't want any more time,' and I was like, ‘We don't want any more time? We're going to need at least 12 minutes,' and we only had nine. He started doing those cheap little pulls and he was pulling the least and pulling the slowest, and then he was the first one to attack us." Robbie McEwen is right back in the thick of the green jersey race with his 3rd stage win of the 2005 Tour. Chris Horner spent 156 kilometers (almost 95 miles) out in front, first with a 5 man breakaway, then with Sylvain Chavanel, with the pair only getting caught in the last 200 meters. Horner still didn't give up, winding up his sprint and finishing 10th on the day. McEwen's leadout man, Freddie Rodriguez, didn't let up when McEwen came around, and took 3rd on the day, denying precious sprint points to Thor Hushovd, who was 5th on the day. Stuart O'Grady was 2nd on the day. 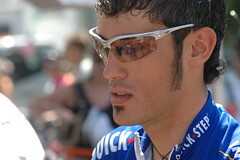 Guido Trenti, an Italian with a US racing license, was 4th on the day. 6) Anthony Geslin, Bouygues Telecom, s.t. 7) Robert Förster, Gerolsteiner, s.t. 8) Magnus Backstedt, Liquigas-Bianchi, s.t. 9) Gianluca Bortolami, Lampre-Caffita, s.t. 10) Chris Horner, Saunier Duval-Prodir, s.t. The only major change to the overall standings is the departure of 5th place rider Alejandro Valverde, which also puts Discovery Channel's Yaroslav Popovych back in the white jersey for best young rider. Saunier Duval-Prodir's Chris Horner read his high placing -- 5th overall with a stage win -- at the Tour de Suisse last month as a promising portent of things to come, perhaps even a Top 10 on the general classification in the American's first Tour de France. Now, after Stage 11's punishing final climb up the Col du Galibier, Horner says he's adjusting his sights. Over at dailypeloton.com, Locutus offers his update on the race so far: Who's outperforming expectations, and who's underperforming. The big thing to remember is how many people with big expectations haven't shown anything this year: Just among the Americans, there are Floyd Landis, Levi Leipheimer, and Chris Horner, but also Heras and Beloki, Santiago Botero, Vinokourov, Ullrich, Iban Mayo and especially Ivan Basso. Most of these guys have picked out a stage they think plays to their strength in the mountains. For at least a few of them, I think it's going to be tomorrow. Vinokourov and Armstrong have a history of making their bones on the mountaintop finishes. Given all the talk about Discovery's strength or weakness as a team, they're going to want to stamp their name all over a mountain stage, and soon. So would tomorrow’s stage, which at first glance looks tailor-made for an Armstrong attack, see more of the champion’s trademark summit spectaculars[?] 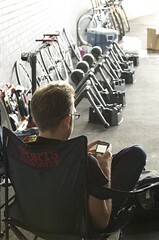 “Well, I hope it’s the same this time,” said Bruyneel. “This is the first big mountain stage so in theory there will be attacks. A lot of teams are ready. But we will see. Rabobank's Pieter Weening took a terrific win as the Tour de France finally hits some real climbs. Weening was the last survivor of a long breakaway. His lead dropped to as little as 10 seconds on the chasing group of Tour contenders, but he was reinvigorated when Andreas Klöden of T-Mobile came across the gap and took most of the pulls into Gérardme. As the line approached, Klöden and Weening wound it up, and it took race judges to determine the winner: from the photo finish, it looked like a dead heat. Liggett says it was estimated he won by 2 millimeters! Armstrong was isolated -- Hincapie, Savoldelli, Popovych: All these guys fell off the group that mattered on a 2nd Category climb. That's a big surprise. Armstrong: "For whatever reason, I was left alone -- we didn't have a great day as a team." Vladimir Karpets takes the white jersey from Yaroslav Popovych; Michael Rasmussen took the polka-dots from Fabian Wegmann. T-Mobile has got to smell blood in the water with Ullrich, Klöden and Vinokourov all surviving to the end against a lone Armstrong. 7) Cadel Evans, Davitamon-Lotto, s.t. 8) Christophe Moreaus, Credit Agricole, s.t. 9) Chris Horner, Saunier Duval-Prodier, s.t. 10) Alexandre Vinokourov, T-Mobile, s.t. 17) Levi Leipheimer, Gerolsteiner, s.t. 19) Michael Rogers, Quick Step, s.t. Azevedo and Hincapie were back at 1:25, while Savoldelli, Padrnos, Rubiera and Beltran were at 2:57. Dave Zabriskie came in 179th on the day, at 1:01:13, but survived elimination for another day. Neal Rogers interviewed Chris Horner (maybe Tuesday night?) on how he's doing on his first Tour de France. I think I can ride into the top 10, even with the problems in the TT. And now I'm lower on GC, so if I find a good group to go with, they're not going to chase me down. Horner says the team is waiting out the first week, "looking forward to the mountains." Dave Zabriskie was named USAToday.com's Athlete of the Week, for his win in the Stage 1 time trial and 3 days leading the Tour de France. This week, despite a nasty fall that cost him the yellow jersey Tuesday, Zabriskie takes USATODAY.com's honors for the second time. Chris Horner was similarly recognized in June for his performance at the Tour de Suisse. When Chris Horner burst on the scene in the mid-'90s, he looked certain to join the ranks of US riders competing at the elite levels of the European peloton, along with Lance Armstrong, Kevin Livingston, and Bobby Julich. Instead, Horner was a bust in three seasons with Francaise des Jeux, then returned to the US, where he won every race in sight (except the USPro championships, which continue to elude him). In 1998, he made the FdJ Tour squad, but had to bow out when he broke a wrist. This year, it looked like he was snakebitten again, when visa problems and an early-season injury kept him out of action for the Tour de Georgia, which he won in 2003, and the Giro d'Italia. Finally, at the Tour de Suisse, Horner took a stage win, and finished 5th overall, escalating him onto Saunier Duval-Prodir's Tour de France squad. CyclingNews talked to Horner after he was selected to the Tour. "I've f*&king got form comin' out of my ears right now!" he shouted at me when I saw him moments after the final [Tour de Suisse] stage in Ulrichen. "Every day, it's just getting better and better." The interview includes sidebars with Horner's opinions on Lance Armstrong and Jan Ullrich, who Horner saw close up in the Tour de Suisse. Chris Horner's win in Stage 6 of the Tour de Suisse, alongside his overall 5th-place finish in the race, prompted USA Today to name him their US Olympic Athlete of the Week.